A few weeks ago, the jQuery plugins website, which developers used to find and download plugins for the popular client-side library, was switched to read-only mode. Developers are now encouraged to use npm to publish and search for jQuery plugins. In this tutorial, we will show you how you can use npm to develop a small web application. We will start from scratch - we will set up a package.json, install a bunch of libraries and make things work nicely together. npm creates the node_modules folder and places the libraries there. In our HTML file, we include the scripts and CSS files directly from the node_modules folder with <script> and <link> tags. When the time comes to put your web site/app online, just upload the node_modules folder together with the other files. This is similar to how Bower works, but has the benefit that we are only using npm without installing additional package managers. Make sure that you have node.js installed. If you don't, download an installer for your OS and run it. This will also set up npm for you. Create a new empty folder for your new website. As an example, we will use project-folder throughout this tutorial. Open a terminal (or a command prompt if you are on Windows) and navigate to the project folder (cd is your friend!). Type npm init. This will create an empty package.json file. Press enter to use the defaults, if you don't know what info to supply. Great! Now you've got an empty folder with a valid package.json inside it. package.json is a special file which is used by npm to write down the libraries you've installed so far, and details about your project. All that is left is to include these libraries in your HTML. We have a basic HTML5 document with a few Bootstrap components. Notice how we've included the bootswatch stylesheet and the libraries by directly specifying their path inside the node_modules folder. I have chosen the modern-looking Flatly theme from Bootswatch, which we installed a moment ago. In the HTML you can also see some of Bootstrap's grid classes, along with a list group for presenting the favorite locations. 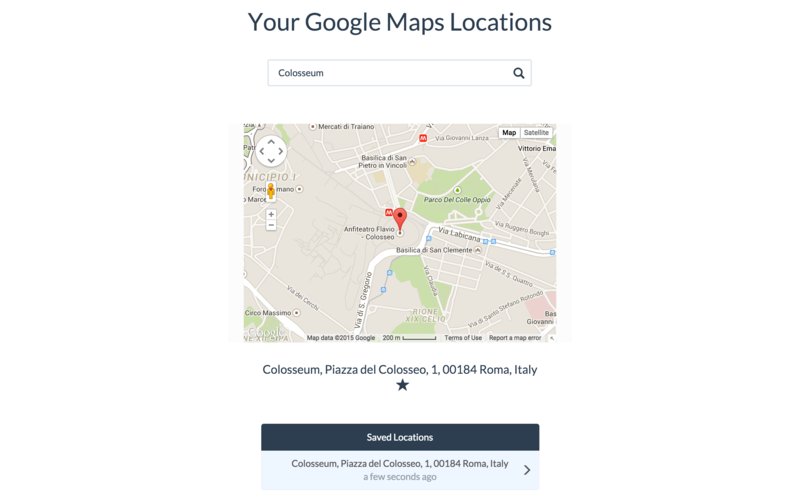 // Initialize a google maps using the gmaps library. // to the current location, and mark it as active. // This functions is called when a favorite location is clicked. We mostly rely on Bootstrap with the Flatly theme to do the styling for us. However I did write a few additional CSS rules, which you can see in assets/css/styles.css in the downloadable zip with the source code. Wow, that's a good article. Thanks Nick Anastasov. You are superman. But if we have specific package Bower for this purpose then why use npm. I think it is cleaner to use Bower for frontend dependency management. I am wondering why it takes long time for the page to load, try to refresh the page and you will see. Nice tutorial! I love using npm to manage my AngularJS projects, it's nice to see it is being adopted for more widespread use with jQuery based applications. I'm curious though, since you are doing a bit of manual 2 way binding here, why you wouldn't use a framework like AngularJS that abstracts that a bit? Still amazed how font-end web development is done nowadays with console commands and the like. At least, this tutorial showed me I'm not as outdated as I feared starting reading the article. Very nice. This was simple and short, a great start for a npm newbie.